Stroll out the front door of this apartment and the charming high street with its countless shops is just 30 metres away. Walk another 30 metres, pass under the gate, and you're on the boulevard. And just on the other side: the Mosel River. You almost couldn't get any closer to this romantic river! It's wonderful to dine here in the evening at one of the many restaurant terraces as the sun slowly sets behind the hills on the other side. You can see the vineyards on these hills where the well-known wine is made, which you can buy anywhere in Zell: Schwarze Katz, meaning black cat. This animal has been the symbol of the town since time immemorial, as you can see from its presence in the main square. The apartment is furnished in a modern design, with a small rear courtyard where you can sit outside. It is intended for 6 people, but can accommodate 8 people upon request. When combined with DE-56856-26 it forms DE-56856-27 for larger groups. It's nice to follow the river upstream (towards Trier) or downstream (towards Koblenz) as it meanders through the hilly countryside. 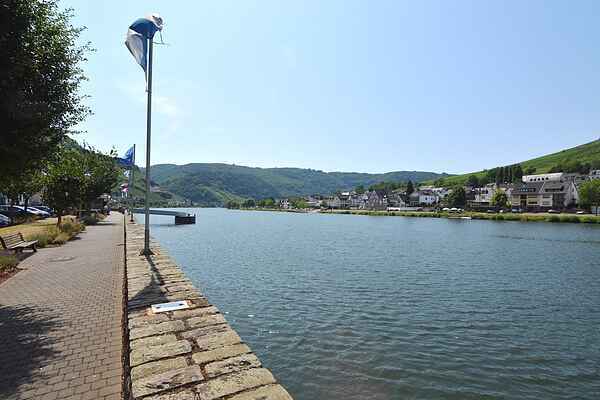 Be sure to visit picturesque Cochem.